Udaari is off to a great start with all the actors making their mark and a script which tells a different story. This episode was brilliant in many ways but the only thing which seemed somewhat out of place was the way the songs have been shot. It would have been far better and it would have looked more real if the actors sang the songs themselves there and then instead of lip syncing to the recordings especially because Bushra Ansari could have done that easily and even if Urwa couldn’t sing herself they should have chosen a singer whose voice went well with her voice. Other than this tiny glitch everything else about this episode was picture perfect. All the actors played their part really well because of which it was easier to connect to their feelings. It is refreshing to see Ahsan Khan in a different role, I wish we didn’t know how this particular track was going to unfold because it effects the overall impression of the character. Right now Imtiaz seems like a caring person who wants to get married to Sajida because he too is lonely and because he likes her but since the main twist in the story has already been revealed therefore most of the viewers know his motives already! This episode showed that Sheedan is the ‘man’ of the family! She is the one who makes all the important decisions and she was the one who confronted Chaudhry’s nephew. Her husband stood there and said nothing and later on too when he wasn’t willing to stay back for work she was the one who told him he should take up the job. Sheedan’s character is that of a very strong and confident woman who does not believe in holding back her thoughts. Although Sheedan’s husband does not look after his family the way a man should but the love between this couple has been highlighted from the first episode. The opening scene of this episode was very well directed and very powerful. Sheedan’s dialogues, the energy with which they were delivered and the way the effect of this incident on Meeran was shown was simply flawless. Meeran wants to give up singing but her mother does not agree with how she feels. The relationship between Meeran and her mother was shown beautifully in this episode. It is good to see a daughter who does not agree with her mother on many things but at the same time she does not want to hurt her. Urwa Hocane’s performance in tonight’s episode was impressive. She made me feel for her character, I could relate to this girl’s struggles. She is fighting a war which she is not likely to win. The accident scene indicated that Sheedan’s husband might die or get seriously injured. Imtiaz and Sajida went from being bhaa and bharjaye to something entirely different in tonight’s episode. These developments were covered perfectly too in this episode. The gradual shift in Sajida’s behaviour and the way Imtiaz convinced her that she needed a man in his life was shown convincingly. Zebu’s consent and feelings for Imtiaz also played a pivotal role in this whole situation. Sammiya Mumtaz is one of my favorite actresses although I loved her as Rasheeda but she is equally good in playing such roles. She has played many such roles before too therefore I am waiting to find out if this one has something new to offer. Arsh, Milli and Farwa’s track was not covered in tonight’s episode which made this episode less crowded and more engaging. I am glad for now the focus is on the characters residing in the village. Their characters and stories are interesting enough to keep the interest of the viewers alive for now. 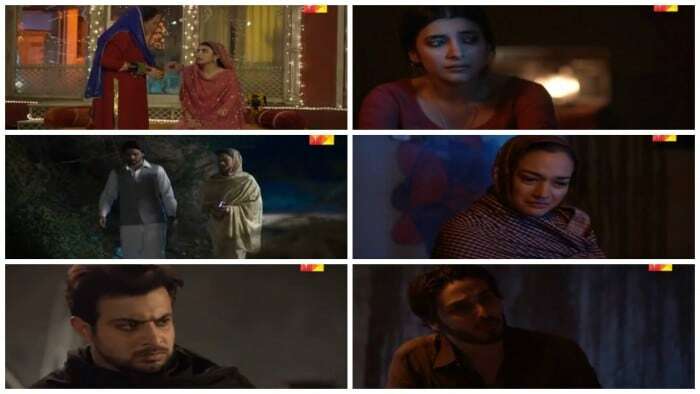 Although all the actors acted brilliantly in tonight’s episode but in this episode Bushra Ansari, Ahsan Khan and Urwa Hocane stood out more than any other.